Hotels need a call center software with the best technology to communicate with their guests. Nectar Desk provides all of the standard features your hotel needs for their call center and more. Your guests will never find it hard to get in touch with the right person with Nectar Desk. Nectar Desk’s interactive voice response (IVR) system will provide a clear path to the right agent at your call center. Nectar Desk also stores all call detail records with the help of our world class computer telephony integration. If you lost a call record in the past, it won’t happen again. In addition to our reliable technology, you also have access to detailed analytics that will track call statistics. 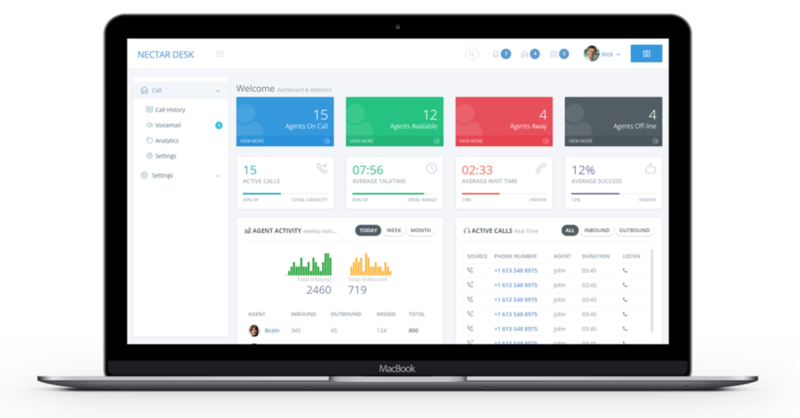 With Nectar Desk’s analytics dashboard, you can evaluate the activity of your phone agents, plan against peak hours and make informed staffing decisions. Your hotel relies on good call center software for inbound and outbound calls. Make sure your hotel is equipped with the best, and sign up for Nectar Desk today.